The Pittsburgh community gathered in the Hill District to celebrate playwright August Wilson's birthday and his impact on our region. Here, service is more than something we do. It's a core part of our University identity. The practice of community engagement—the exchange of resources between Duquesne and its surrounding communities—has been central to our mission since the University's founding in 1878. Today, that tradition is alive and well—and reaching more people than ever before. At Duquesne, learning extends beyond the classroom. Through CETR, Duquesne connects students and faculty to learning and research experiences in the community. Whether we're addressing community trauma with FOCUS Pittsburgh or coaching local youth through our Reading to Play, Playing to Read initiative, we prepare students to contribute to—and create—a more just world. The Office of Government Relations is the primary liaison between the Office of Community Engagement and elected leaders and policymakers at the local, state and federal levels. 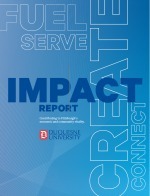 The office advances Duquesne's education, research and economic development priorities and increases awareness of University programs, strengths and accomplishments. Contact Alexandra Kozak for more information. Housed within the Center for Student Involvement, the Office of Co-Curricular Community Engagement combines real-world experiences and academics. Student volunteers complement classroom learning through intentionally designed service opportunities that benefit our neighbors. Duquesne is the only college or university in southwestern Pennsylvania to earn the prestigious Carnegie Foundation for the Advancement of Teaching Community Engagement Classification. The University first earned this distinction in 2008 and will hold it until 2025.